Welcome to Mr. Suave's Mod Mod World. This week's show is brought to you by the letter Y as in Y chromosome. It's mod men week on the modcast. 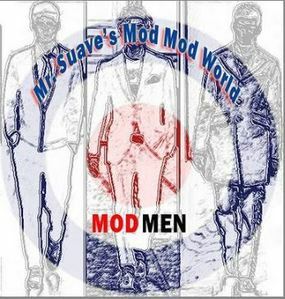 I've collected songs from mod men, some with undeniable mod street cred like Ray Davies, Steve Marriot, or Paul Weller, and to others like Mose Allison and Paul Heaton who I will go to my grave arguing are every bit the mod as any other man. Regardless of all that, you can't argue with the songs. It's another great mix, if I do say so myself. It was hard to put together the list, partly because what I really wanted were established artists who were now doing solo work. It was easy for some of them. Then there were others, like Steve Marriot who I really wanted to put in the show, that I had to dig deep and still found them in a band situation, or guys like Mose Allison who have essentially been solo artists for their entire careers, I included them anyhow.